Did you know that Eat Bulaga host Valerie Weigmann is a Bicolana? Her mother, Delia Clacio Weigmann is from the region. Did you know that Valerie Weigmann is a Bicolana? Valerie Weigmann: Marhay na hapon mga kababayan ko! Yesterday, Valerie showed off her Bicolana roots when she remarked "Marhay na hapon mga kababayan ko!" 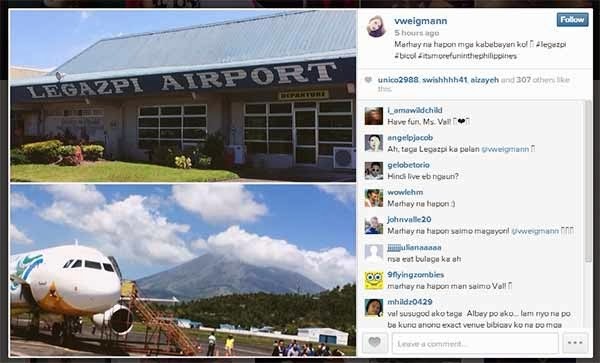 on Instagram and Twitter, right after she landed at Legazpi Airport. This isn't the first time, however, that Valerie made known her origins. Last year, she mentioned on an episode of Eat Bulaga that her Bicolana mother was working in Germany, where she was born. Delia Weigmann is reportedly a kitchen assistant while Valerie's father is a chief cook. Valerie was born on November 22, 1989 in Weisbaden, Germany. She studied at Werner-von-Siemens Realschule in the same town. When she was in her teens, she went to the Philippines to pursue a career in modelling. Valerie started to make a name in the industry when she joined ABS-CBN's Pinoy Big Brother Teen Edition Plus. She was linked with Ejay Falcon, a fellow housemate. Because of her looks and quirky personality, she was frequently referred to as "Crush ng bayan." The actress-model also guested on several shows, such as the now-defunct That's My Doc on ABS-CBN and TV5's Kidlat. She was also in the 2013 film, Ang Huling Henya. Valerie joined GMA's Eat Bulaga as one of its hosts in 2013. It was on the noontime show that she earned the nickname "Ang Tisay ng Barangay." Yesterday, she came home to Bicol to join Eat Bulaga's Juan for All, All for Juan: Sugod Bahay sa Barangay activity in the Barangay Puro, Legazpi City. Also expected to attend the activity are fellow Bicolano Wally Bayola, as well as Jose Manalo and Paolo Ballesteros.